For a genre that has inspired a huge amount of growth and change in eSports and video games as a whole, there’s been very little evolution in the MOBA genre in its early years of growth. 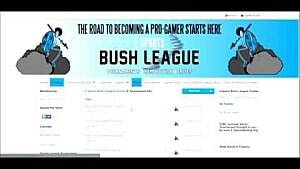 DotA Allstars established the formula, League of Legends and Dota 2 improved on and attempted to perfect it, and the vast majority of other claimants to the genre did their best to latch on to those concepts with varying degrees of success. It’s only more recently that we’re starting to see variety in those established ideas. Heroes of the Storm did away with many of the core elements of the genre and rebuilt it to focus on map objectives. Battlerite condensed the action into a focused arena-like experience. Battleborn made the switch to first person, but Overwatch and Paladins took that switch further and kickstarted the concept of the MOSA. For some time, SMITE has held the niche of being a more action-oriented MOBA, with its over the shoulder camera system and heavy skillshot usage. Other attempts such as Super Monday Night Combat weren’t as well received or as resilient in the market and have largely dropped off while SMITE holds steadfast. 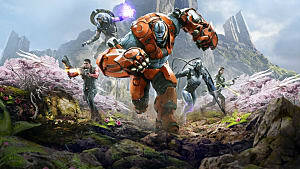 More recently, we’ve seen games such as Gigantic working to be more of a third-person shooter with MOBA elements, taking the action aspects one step further. There was, however, some hype generated about another upcoming MOBA that was drawing on the over the shoulder style of SMITE but in a sci-fi setting. 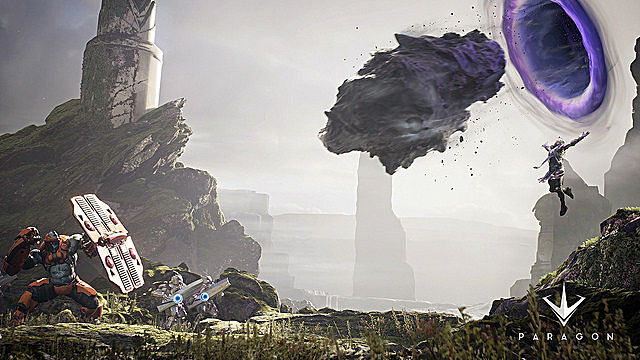 Developed by Epic Games and built to utilise the best of their Unreal Engine 4 technology, the game was a visual treat and would hopefully have exciting gameplay to match. That game has since gone into open beta as of August 2016... but it rarely gets talked about or mentioned anymore, with all hype and discussion apparently dying down. 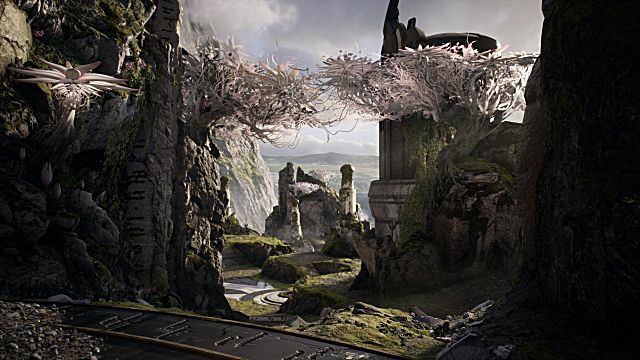 So I’m here to answer the question: whatever happened to Paragon? 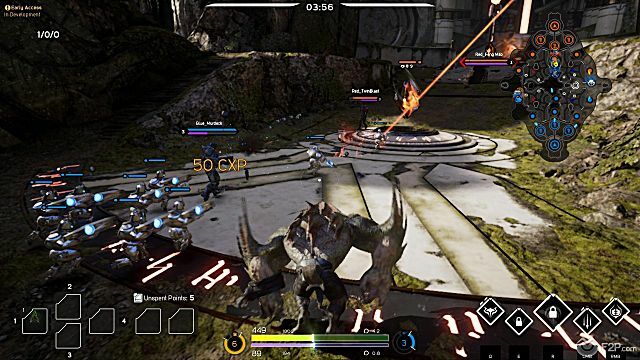 Available for both PS4 and PC, Paragon is a Free to Play MOBA that follows the now traditional concept of a five-on-five player match, set on a three lane map with a jungle interspersed between the lanes. These lanes have towers that need to be destroyed, and if you make it all the way to the end of the lane you will be able to attack and destroy the enemy’s Core. Aiding the players are waves of minions that spawn and proceed down these lanes, and players can destroy these to gain resources. These resources can be exchanged for items to power them up, and ultimately the first team to destroy the Core wins. It’s pretty stock-standard for MOBAs, and the average game will feel a whole lot like League of Legends at first. 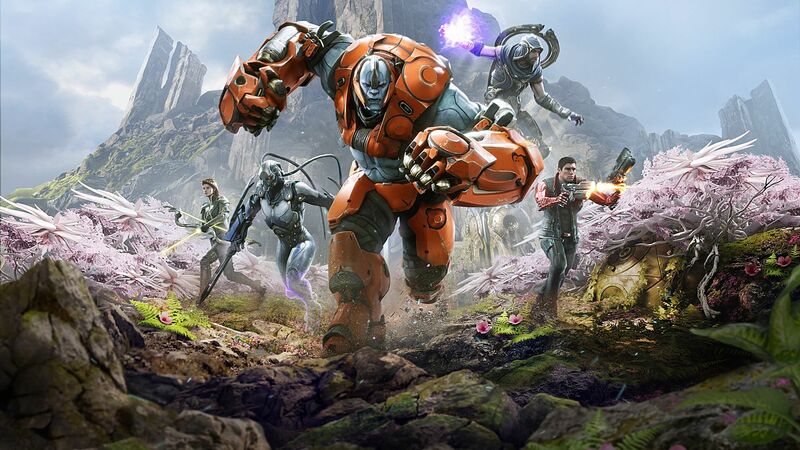 Where Paragon tries to differentiate itself is its use of a 3D space. Playing a lot like a third person shooter, you’ll find that traveling through the map will take you through winding paths, up and down inclines, or even into vantage points that you can snipe from or drop down onto unsuspecting foes. While line of sight and verticality does affect play in Dota 2, it’s a much larger point here. Still.. aside from the fairly sci-fi feel of most of the character designs, there isn’t a whole lot new here. Nothing about Paragon is likely to astound or truly surprise a veteran MOBA player, but the attempt to push the traditional action/shooter feel might serve as a bridge to gamers who’ve never made the jump into MOBAs. This is especially true on the PS4, which has lacked many of the more serious contenders in the genre up until this point, and is made even better by the addition of crossplay with the PC to keep the player base stable. Where Paragon shines is, not surprisingly, the graphical department. 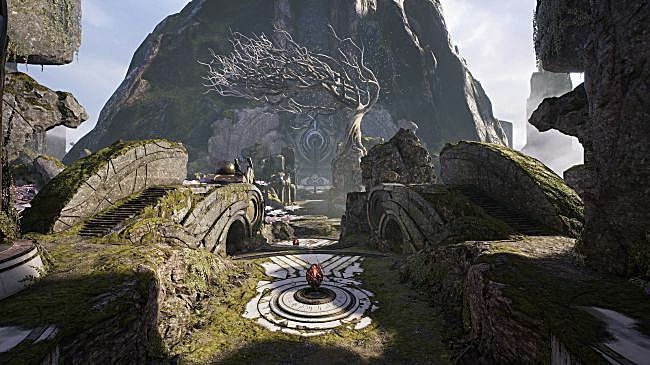 Given that the developer Epic Games is most well known for their Unreal Engine technology, it’s hardly surprising that the game could easily serve as a tech demo for what the engine is capable of. My PC was unable to run the game at full settings smoothly, but even on lower settings the game is absolutely gorgeous to look at, and video footage of the PS4 version or from high-end PCs is a visual delight. Admittedly, while the graphical quality is extremely high, the designs are nothing too special. Paragon presents a very standard sci-fi setting, and most of the archetypes you would expect to see here are well represented. There’s large and bulky alien brutes, strangely small and comical creatures riding atop larger beasts, robots and robotics engineers of all types, the ruggedly handsome space rogue... you name it, it’s probably here. 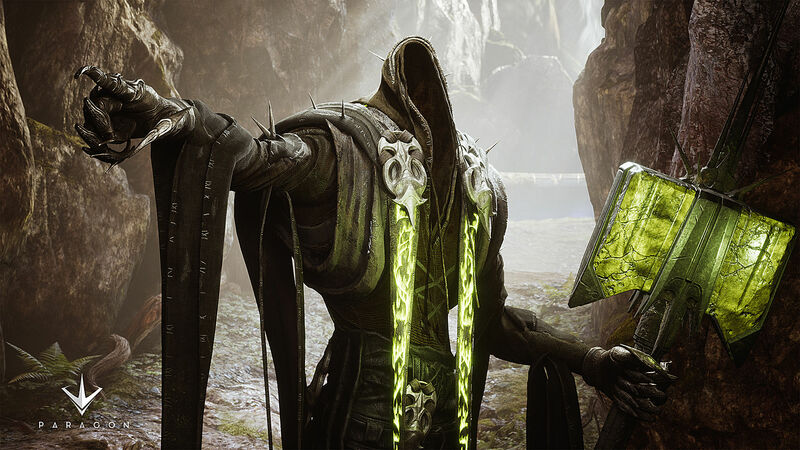 Paragon isn’t afraid to dabble in more fantastical elements either, with characters such as The Fey -- a nature-wielding fairy -- or magical psionic-wielding caster types. They all look amazingly detailed, but they don’t really stand out that much as new ideas go. Furthermore, there are times where the colour palette seems a little too muted. Compared to the bright contrasts of most other MOBAs, the graphics are pretty on a very technical level, but the designs sometimes make individual features or characters struggle to stand out. The host of name tags and health bars can accommodate this, but it's still a minor complaint to bring up. 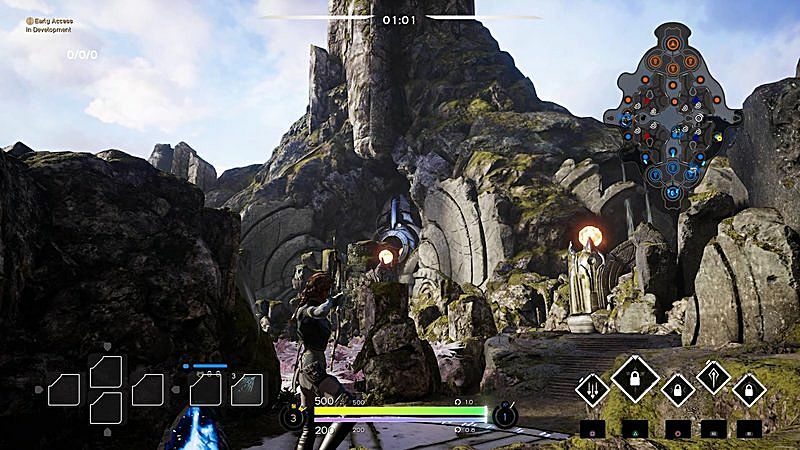 Since quick response times based on visual recognition are important for fast-paced action games to succeed, this can occasionally be a detriment, but Paragon manages to balance this with excellent sound design. The characters sound unique and sharp, so keeping an ear out for audio tells can be the difference between life and death where visuals are not. Still, there is no denying that in the heat of the moment when both teams are gathered and spells are blazing left and right, it is quite the spectacle and a real delight to watch. Good graphics aren’t enough to make a game play well, however. So with a comparatively standard MOBA setup, what feature does Paragon have to stand out from its competitors? The answer is the card system. The average MOBA will see most of the early parts of the match farming up resources in order to purchase items and further your character’s power. Most of these items are available to just about every character, even if not ideally suited for them, so you can experiment and change up your build according to the situation. 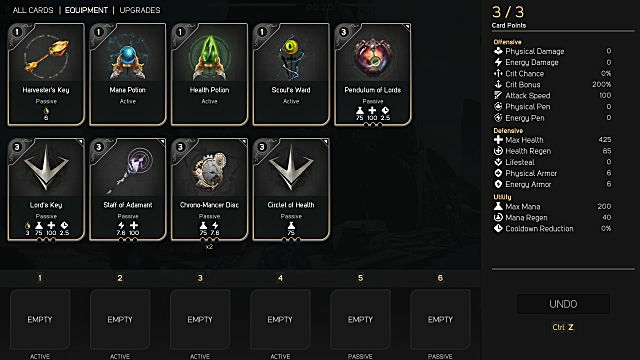 Instead of going for that exact route, Paragon tweaks the formula by instead providing the player with cards to represent these items. Players must then build decks out of these cards, and this will provide the basis of the items you have available in your shop. Some basic decks are provided for each character when you start out, but to truly excel and master a character, you’ll want to customise them to suit your playstyle and their role. 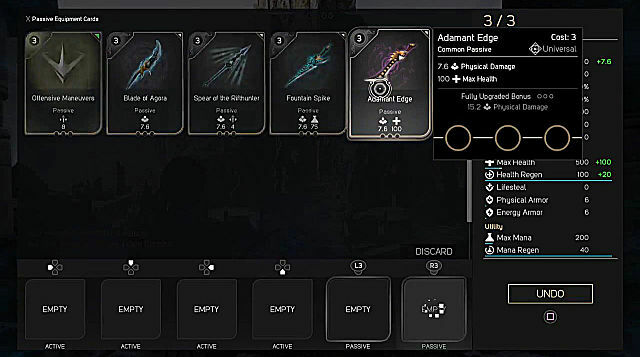 Cards can consist of standard items or upgrade cards. Item cards give you the base item with a set of stats depending on which you’ve chosen. Each item has three upgrade slots that you can assign cards to, and purchasing all three upgrades in game increases the base power of the item card in addition to giving all the upgrade effects. As such, it’s still better to have a standard six item build by the end of the game to maximise effects, though you can play around with this concept. Some of these items also serve as the game’s consumables, serving as healing potions or vision wards. These can be replaced or discarded as the game progresses depending on what else is in your deck, but by the end of the game you can have four active and two passive items. In addition, every card has a cost to use in your deck, and you cannot exceed 60 points in cost. You can also have 40 cards at most in a deck, but if you’re doing the math, a full item build with six fully upgraded items is 24 cards. That gives you plenty of room to play around with situational items or things to use in the early game. There are further limitations on what kind of cards you can use, though. The cards are split into multiple types, defined as Affinities, and each character possesses two Affinity types. As such, their decks can only consist of cards belonging to those, as well as the set of Universal Affinity cards. This effectively limits some of the more outlandish combinations you can do, such as a full physical damage build on a support, but it can also serve as a better guideline for how you should be building a set character. 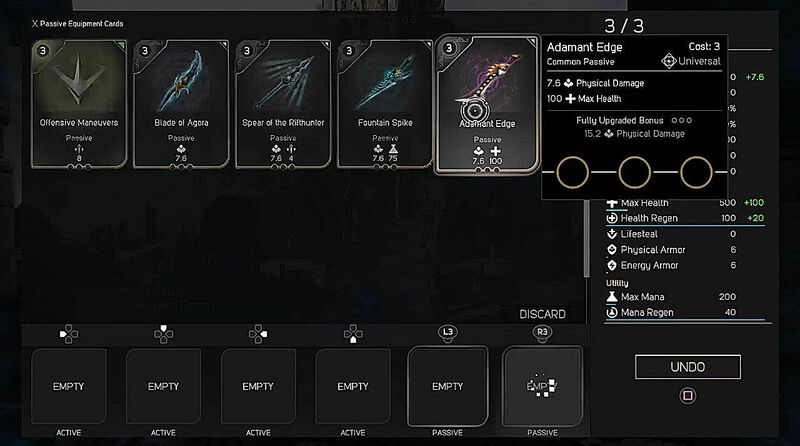 Unfortunately, while an interesting spin on a standard concept, Paragon has the exact same problem that a vast number of card-based systems do: reliance on luck to get what you need. You can get card packs by completing quests or by using currency, but since some of the more interesting or powerful cards can be rarer than others, you might find yourself missing the kind of effect you really need to round out a build. Sure, this might encourage someone to pay microtransactions and support the game, but doing so for a chance to get what they need is far less satisfying a purchase than, say, buying a new League of Legends champion. There is a card crafting system due to be implemented very soon - perhaps even by the time this article is finished - but there’s no guarantees that this will solve all the issues and alleviate all potential complaints about the system. Epic Games are playing risky here, and only very careful balancing is going to keep the game stable. Further updates will likely see the game’s balance dancing on a knife’s edge. Epic Games have done a reasonably good job of keeping a content cycle flowing. In addition to the impending crafting system which has been teased for some time, the current map that the game uses is being overhauled and replaced in the very near future. This should hopefully alleviate some of the balance concerns that the players have. What’s more, new characters are still being developed at a fairly quick pace. So far, Paragon has maintained its initial announcement of releasing a new character every three weeks, with the vampiric Countess the newest to join the fray. There’s currently 24 playable heroes, and additional information has been datamined regarding a potential 12 more. It’s a little less than some MOBAs, but it’s still in beta so there’s time to flesh out the roster. 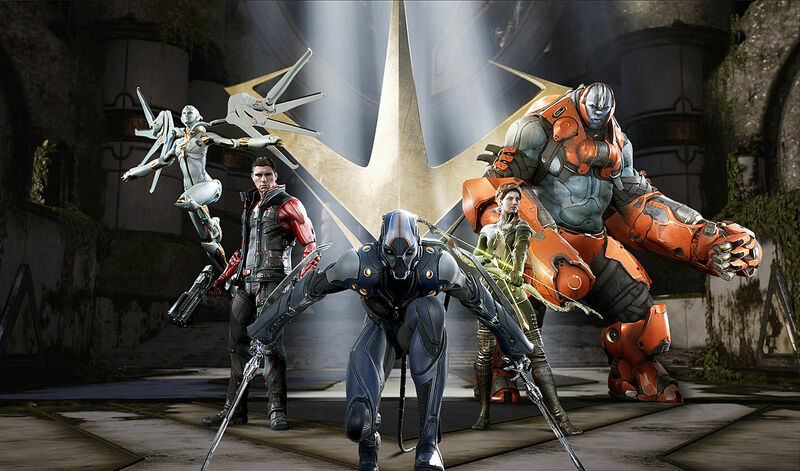 As much as a varied roster is needed for a MOBA to do well, what truly matters the most is having an active and lively community... and this is perhaps the biggest issue that Paragon seems to be facing. Currently, there are no official player counts or metrics offered by Epic Games, but data aggregate websites put the total Paragon account total at a little over 1.5 million accounts. That may sound like a lot, but it’s difficult to tell how many of those are unique accounts, let alone if they’re active, so the player count is likely drastically lower than that. In addition, after an initial surge of popularity and viewership during the open beta release, the game has since dropped off again. 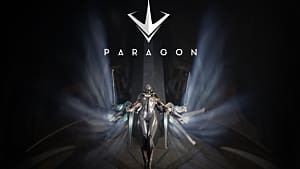 At the time of writing, Paragon is quite a way down the list of active games on Twitch, with only a fraction of the viewers of niche MOBAs like Heroes of the Storm or SMITE and holding about the same numbers as Battlerite. It might be hard to tell how many are playing, but there are certainly very few watching. In attempting to get information for this article, I spent some time browsing for active communities and discussions, but they’re sadly few in number. It’s also difficult to tell just how positive they can be; the official forums seem to speak very negatively, but then again, that can be said about just about every MOBA. The best way to get a feel for how the game is doing is to leap into it myself, which is what I did. Unfortunately, I was met with a wall of extended queue times that ultimately lead me to want to play something else. Even for Co-op vs. AI, I was waiting for nearly ten minutes before finally giving up. It was a simple enough matter to get a feel for the game itself in the purely vs. AI mode, but that’s hardly indicative of the health of a MOBA. More importantly, I find it hard to imagine a new player to want to stick with the game all that long if they’re left waiting so long before they’re able to actually play. As such, it’d be a stretch to say that the game is doing all that well in that sense. 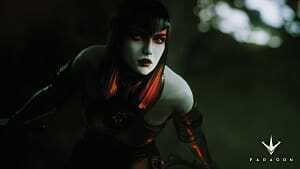 Where does Paragon go from here? So let’s recap. 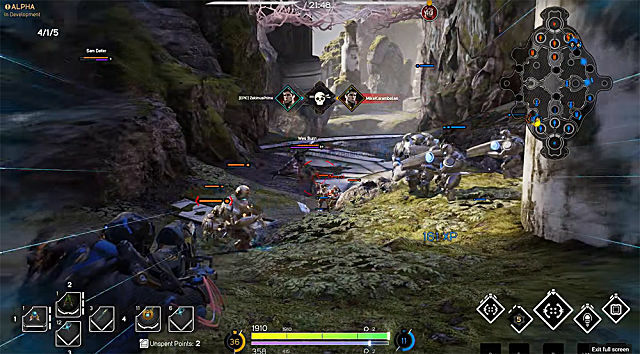 Paragon is a fairly standard MOBA, with a more action-orientated feel, that uses a card-based system to shake up the usual item progression system. It’s visually impressive, handles and plays reasonably well, features crossplay between PS4 and PC, and is currently in open beta. 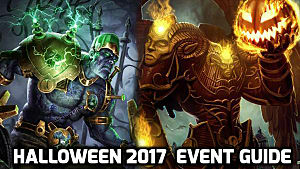 It’s free to play and will remain so even after launch, with all heroes available for all players at all times. 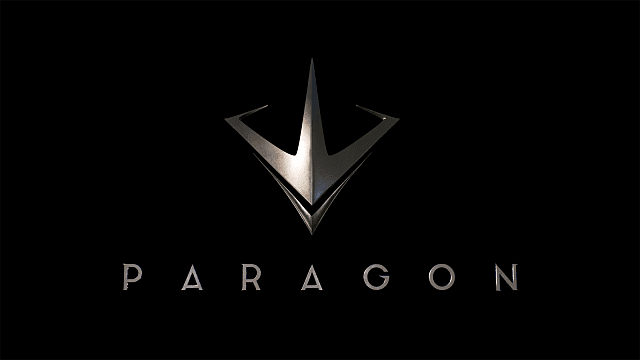 With all that said, you would think that Paragon is doing okay, and by many metrics it might be. There’s a reasonably solid game here, one that’s well-polished for an open beta title. But in the competitive world of MOBAs, it simply isn’t enough to be solid or good. In order to maintain a sizable and active player base, a game has to be more than the sum of its parts, and currently Paragon isn’t. 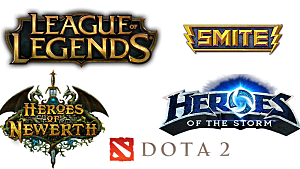 Multiplayer games, be they MOBA or otherwise, need a sizable player base to keep them alive. At the moment, that simply doesn’t appear to be the case, and it’s anybody’s guess if the game will continue on long enough to form a comfortable niche as other games have. That’s not to say it’s too late for the game, of course. 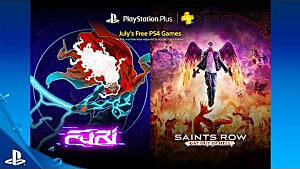 If any of this sounds intriguing to you, I’d advise you to give the game a shot. It's free, and there’s plenty of fun to be had if you're patient. But in the end, only time and numbers will determine whether the game manages to remain afloat. 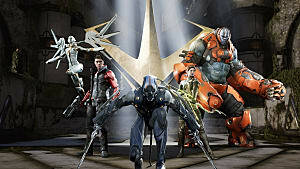 For more information on the game, check out the Paragon website. Have you played Paragon? Do you have any more thoughts and feelings to add? Feel free to share them with me in the comments.